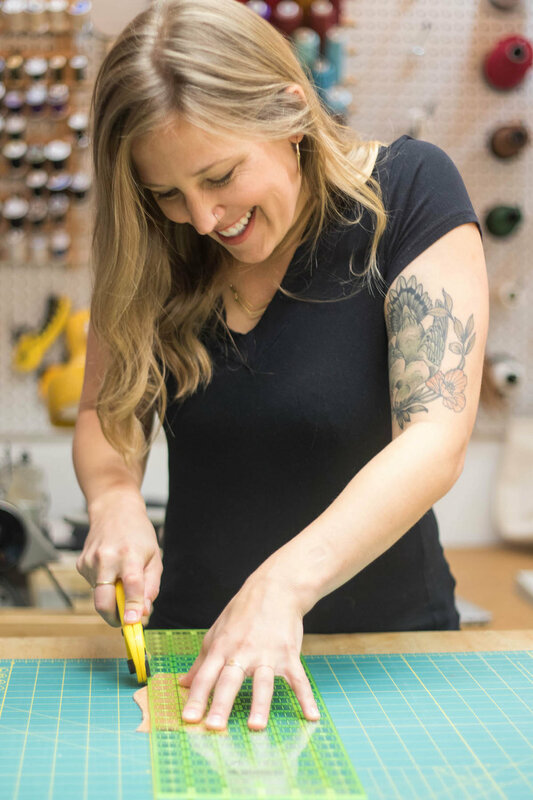 Join Lydia Rhyne of Brass Button Events for a Design Week Exclusive evening of leather work and marbling, exploring the ancient art of ink floating and printing. In this 3-hour Design Week Portland workshop, we learn about the ancient art of marbling with a leather working twist. Using a thickened water bath and specialty inks, we’ll create beautiful, one-of-a-kind patterns and designs. After a couple of test prints, we’ll make one final design to use for our vegetable tanned notebook cover. After printing, we’ll finish by learning how to stitch up the pieces using waxed thread. Each notebook cover fits a Field Notes memo book—included with class! This workshop is great for absolute beginners and seasoned artists alike. You’ll leave with a beautiful, unique notebook cover and a Field Notes memo book to go with it. All materials are provided. Workshop price includes leather, thread and Field Notes memo book. No prior experience necessary whatsoever. Lydia is the owner of Brass Button Events, a creative workshop business focusing on private and corporate events. She is also a sewing teacher and part of Klum House’s creative collaborative. Constantly inspired by new creative mediums, Lydia’s worked in photography, sewing, leather working, watercolor painting and more. She believes that creativity lives inside everyone and teaching is about creating a judgement-free zone that allows you to explore, laugh at your mistakes and smile at your accomplishments. See more of her work here. Lydia was really patient and happy to answer any questions. Very relaxed, judgement-free environment for learning. We are located inside the Hub Building hallway corridor (we do not have a sidewalk storefront). Enter through the Hub building door on N Williams with the Klum House sign above it. Walk down the hall & take a left. You'll see the Klum House sign hanging above our door. *Please note: We have street parking, so please arrive a few minutes early to allow ample time to park. Questions? Send us a note! We require at least 7 days notice prior to the start of class to cancel for a full refund. We require at least 48 hours notice prior to the start of class to rebook for a later class. Full payment for class is due at time of sign up in order to secure your spot in class. No shows forfeit any refund or rebook. If Klum House cancels a class that you registered for, you are entitled to either a cash refund or a rebook to a later class. If you transfer your registration to another class with a higher price, you are subject to pay the difference.